To help get you started with implementing a solid preventive maintenance program we have put together a simple worksheet that you can use to document step by step PM procedures for technicians to reference. It also gives them an area to record faults and check boxes to mark what they have completed. Q Ware CMMS Software makes it easy for preventive maintenance planners and managers to set up and upload checklists and pm procedures into the software. You can create them using a built in text editor that allows you to upload photos, links, and documents. It has the same functionality as popular email services such as Microsoft Outlook. Attach uploaded documents such as checklists or equipment spec. sheets in any file extension you want. Below is an example of how you could set up your preventive maintenance checklists and procedures in the Q Ware preventive maintenance software module. Follow check list attached to this PM. When finished, sign off on PM check list. 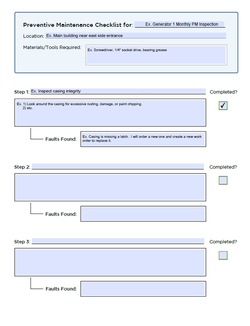 When updating the status of the work order in the system, upload the completed PM checklist.